The US Department of Transport has granted scheduled air service rights to six US airlines between America and Cuba after more than 50 years’ absence due to strained political relations. American Airlines, Frontier Airlines, JetBlue Airways, Silver Airways, Southwest Airlines and Sun Country Airlines have all been awarded flight slots to non-Havana destinations. Airlines granted scheduled air service between America and Cuba.Airlines granted scheduled air service between America and Cuba. Image courtesy US DOT. 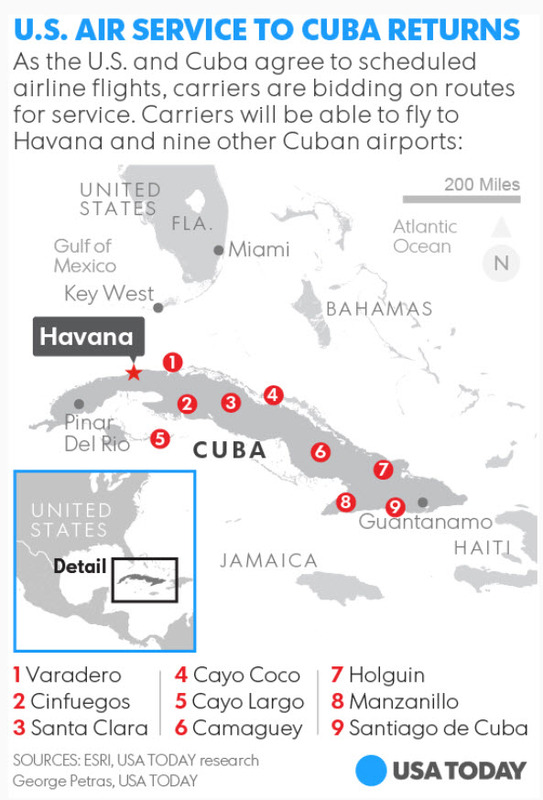 While flights to the capital city of Havana will not be announced for another few months, Cuba’s other nine international airports are set for a rapid rise in traffic from the U.S.A.
Miami and Fort Lauderdale airports were awarded the most number of slots, with the highest concentration of Cubans in the country based in southern Florida. Other cities set to begin flights include Chicago O’Hare, Philadelphia and Minneapolis. The new flight corridor will see 110 daily flights between the nations, although only 20 of these have been set aside for Havana flights. At only 228 miles from Miami to Havana (367 kilometres), less than an hour’s flight, US airlines have been scrambling to file for the hot new flight slots with an anticipated high demand for seats. 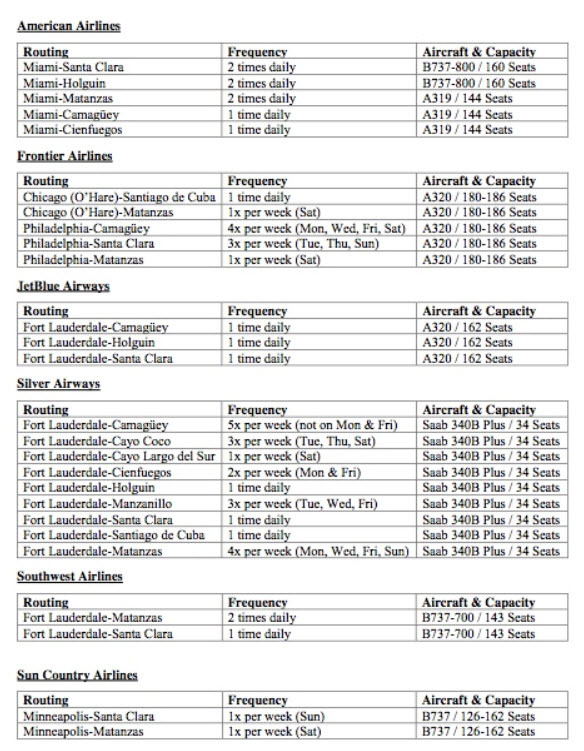 All of the non-Havana requests from carriers had been granted, with exception of Eastern Airlines due to their current charter only carrier license. Flights will begin later this year with seats expected to be on sale soon.